Daily news of funding cuts and orchestras under threat is very worrying. But when I read on another blog recently that we had won the fight for a celebrated cellist's instrument to earn air miles I knew that the corner had been turned and classical music is on the mend. 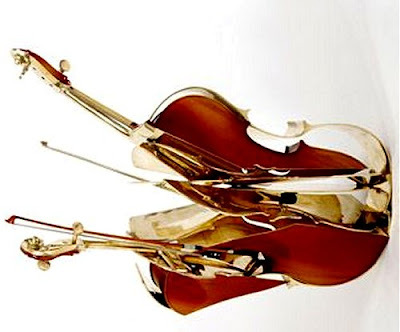 Arman’s artwork Thale’s Cello in bronze and wood has been rotated in my header image. The artist’s tomb in Père Lachaise cemetery, Paris also features a deconstructed cello and can be seen in my post In the shadow of Chopin. Arman was married to avant garde composer Eliane Radique and supplied the artwork for the CD set of her masterpiece Trilogie de la Mort.